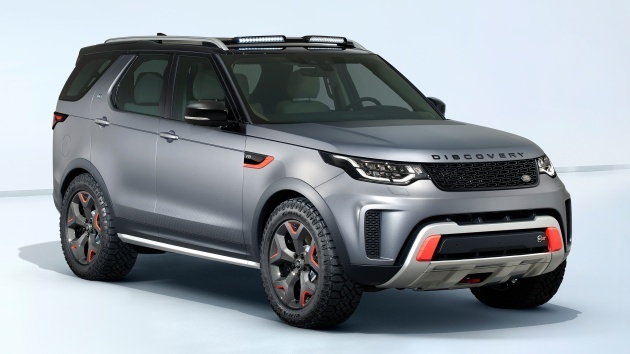 Earlier this year, Land Rover revealed plans to introduce a high performance variant of the new Discovery with improved off-road capabilities. Well, instead of slapping on a 3.0 litre SDV6 turbodiesel as you’d expect, the guys at SVO (Special Vehicle Operations, JLR’s performance arm) figured it’d be better off with a 5.0 litre supercharged V8. The petrol engine is lightly tuned to make 525 PS (up from the standard 510 PS from the Range Rover) and 625 Nm of torque and is mated to a beefed up eight-speed automatic transmission, now featuring a twin-speed transfer box for optimum control off the beaten path. Gone is the usual rotary shifter from the standard model, replaced by a nicer Pistol Shifter that is much like BMW’s, which gives the option of sequential gear changes through the knob. The Discovery SVX has a higher ground clearance by raising the air suspension on all four corners, improving approach, departure and break-over angles. The shocks have a slighter longer travel distance and the knuckles have also been revised accordingly. Complementing the rugged setup are 815 mm 275/55R20 Goodyear Wrangler all-terrain tyres wrapped around forged aluminium alloys. The rubbers have higher side walls and feature more aggressive treads that grip better on soft surfaces. Unique to the SVX is Hydraulic Active Roll Control (H-ARC), which enhances wheel articulation and body control while off-road and improves stability and body roll on paved roads. This works in tandem with the standard suite of electronics aids, such as hill descent control, all-terrain progress control and a specially tuned Terrain Response 2 system. Visually, it receives new front and rear bumpers with orange accents and protective skid plates, an anti-glare bonnet finish and a dedicated electric winch system mounted to the back of the SUV. This production version in Frankfurt is finished in satin Tectonic Grey with Narvik Black Dynamic grille and side vents with V8 lettering, silver roof rails with a special roof-mounted LED light pods. 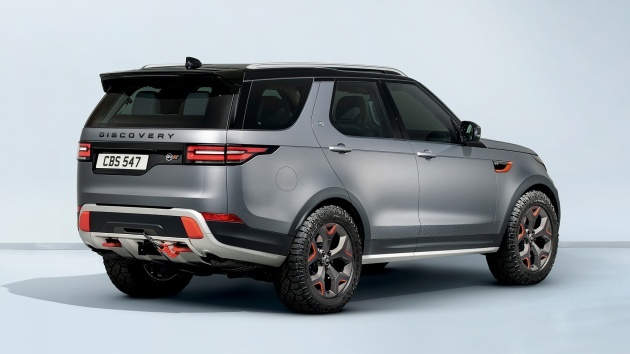 The Land Rover Discovery is the first to be christened with the off-road biased SVX badge, one that will soon trickle into the rest of Land Rover’s product portfolio. It is the first SUV to be hand-assembled at the SVO Technical Centre in UK, with production scheduled to begin in 2018. What is so good about this LRD SVX ?? # A dedicated electric winch system mounted to the back of the SUV – Watch the video. # Comes with silver roof rails with a special roof-mounted LED light pods. # The first SUV to be hand-assembled at the SVO Technical Centre in UK. If the above did not convince U yet, start the engine, prod the throttle & give it a Go. After listening to the V8 growl, U will be convince that this may be the best SUV yet by LR. Just too bad that it is out of reach of most Malaysian.